You'll be £10.99 closer to your next £10.00 credit when you purchase Decisive Battles of the American Revolution. What's this? Decisive Battles of the American Revolution remains the best concise history of the war's military action. Historian Joseph B. Mitchell's acclaimed account recreates in detail all the battles, sieges, and campaigns from Lexington to the final victory at Yorktown so that readers can have a better idea of what actually happened during the course of six years fighting. 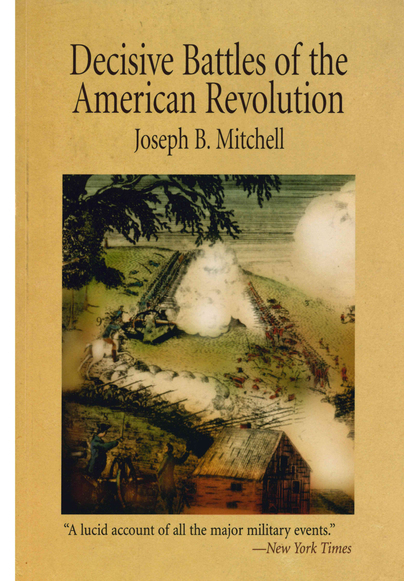 In clear and dramatic language, Mitchell analyzes the military tactics on both sides and describes the progress of the war - from the ragged militiamen in New England who mustered to call of arms to the quiet resolve of George Washington and his maturing troops who became capable of successfully engaging Europe's finest. Throughout, maps illustrate the disposition of forces, movement of armies, and the strategies devised by the commanders. For the reader concerned with the stirring events that led to independence. Decisive battles of the American Revolution in an indispensable guide to understanding how the Continental Army defeated the forces of a mighty world power. This new edition contains current information about American Revolution battlefields and related historic sites open to the public. Joseph B. mitchell (1915 - 1993) served as Chief Historian of the National Battle Monuments Commission. A graduate of West Point, the Field Artillery School at Ford Sill, and the Command and General Staff School at Fort Leavenworth, Mitchell commanded a field artillery battalion in Europe during World War II and was a regular Army officer until 1954, ultimately retiring with the rank of Colonel. He is also the author of Decisive Battles of the Civil War.